IllumiNations, like IllumiNations: Reflections of Earth today, was the culmination of all the nighttime spectaculars that came before it when it was launched in January of 1988. It featured fireworks, lighting effects, lasers, and a score composed from every corner of the world, and it could be seen from all corners of World Showcase. I could regale you with tales of how my parents tucked us away under ponchos on their laps in a bench in Italy just to wait out horrible weather to watch the show, but that’s not why we’re here today. 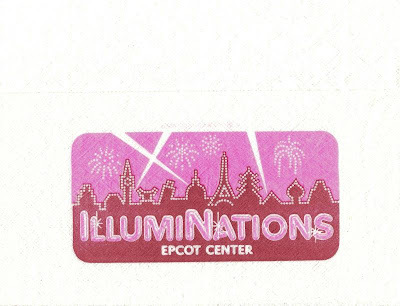 The logo for IllumiNations features a purple skyline of World Showcase outlined in white lights, not unlike the manner in which the pavilions themselves were outlined during the show and its current incarnation. Fireworks burst and lasers slice across the pink sky. 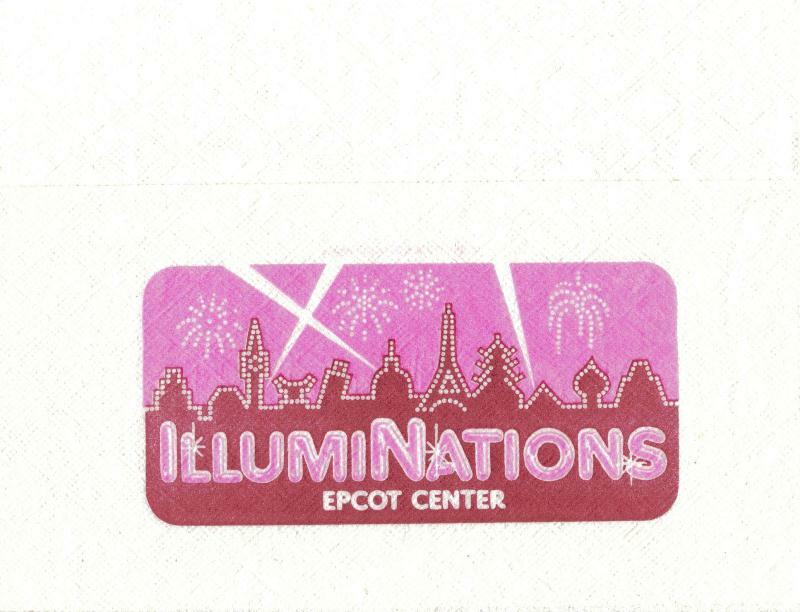 In case you haven’t caught on, this isn’t just the logo, it is actually the napkins utilized at EPCOT Center to promote the show. As if IllumiNations had trouble drawing a crowd. This napkin is truly a representation of the bygone days of vacationing now. Walt Disney World’s napkins have always had a special flare to them. Whether it is the printing of a slogan, such as Let the Memories Begin, an image of Mickey and Minnie decked out in spooktacular costumes, or just the simple emblem of Walt Disney World, plain napkins have long been outlawed inside the Vacation Kingdom. The idea that a nighttime event was worthy of being printed on an ungodly number of napkins in EPCOT Center shows just how much the littlest detail mattered. Those of you who have visited Walt Disney World in recent weeks may have noticed a new trend in napkins. While I have no doubt that you may have seen some napkins printed with a celebratory design, I’m willing to bet, even if you didn’t notice it, some of your napkins were blank. Walt Disney World is beginning to implement a plain treatment to their napkins. It may have been a small thing, and it more than likely went relatively unnoticed, but the printed napkins have always been fun for me. Did I stuff some in my bag every trip? Sure, but mostly so I had something to dry off my glasses with after Splash Mountain or to clean up an unexpected soda spill. In all actuality, while I would look for new napkins on every trip, more often than not, the ones I stashed ended up in a trash can somewhere. IllumiNations did need a napkin to entice guests to witness is awe-inspiring displays, but it was nice to have the reminder at every meal. Rather than see plain napkins move into Walt Disney World, I’d personally love to see more napkins individualized per park, per restaurant, or highlighting special events and shows! Of course, that’s greedy of me and not likely cost effective, but it’s okay to dream about Walt Disney World, isn’t it? These little things are what make Disney so special. We all know it - hopefully the blank napkins will not be the start of a trend. The bags, the napkins, the receipts - I still have them from my first trip to WDW last year. I brought them out the other day checking a date when we ate in Narcoosee's. It was such a nice experience just seeing and handling them. I agree with Debbie V: little details like fun prints on the napkins all add up to make the vacation even more memorable. You don't get whimsical images on restaurant napkins in the "real" world -- it's one more great little surprise that makes you glad to be at Disney.